Stealth bombers. Q-ships. “Sleepers.” On four wheels, these are the machines that roll past the speed traps, mall cops, and prying eyes of the neighborhood association. Of course, “sleepers” also feast on a steady diet of overconfident stoplight marauders in tuned Civics. But that’s on the road. 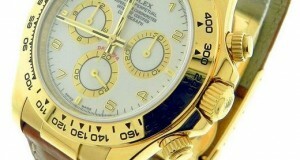 On the wrist, a “sleeper” is a pre-owned luxury watch with undiscovered value and collector potential. Just like their road going counterparts, certain chronograph watches for men just slip beneath the radar of the collector market… for a while. If purchased before the market awakens to their merits, these timepieces can provide unmatched enjoyment for the money and investment return for the long haul. Everyone knows the Audemars Piguet Royal Oak Offshore Chronograph. Having said that, we’ve no more need to fete this model. All hype aside, the Offshore Chronograph is an awkwardly constructed device that has relied on outsourced complications and two-part modular chronograph construction from the first Ref. 25721ST of 1993. Although the latest Caliber 3126/3840 Offshore upgrades to an in-house base movement with a higher degree of finishing, the buried date disc and graceless case girth speak to the enduring limitations of the Offshore’s module-on-base mechanics. However, there is an AP chronograph watch for men that combines a seamlessly integrated chronograph par excellence with a unique and highly technical case. The Millenary Chronograph (Ref. 25897ST.OO.1136ST.02) joins Audemars Piguet’s peerless case and dial finishing standards with a high-end integrated movement boasting quality to match. Designed by then 24 year-old art prodigy Emmanuel Gueit – the same auteur behind the famed Offshore Chronograph – the Millenary Chronograph was just as innovative as its octagonal sibling. 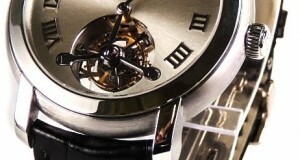 When the Millenary was launched in 1995, it marked the Le Brassus manufacture’s entry into the oft-treacherous waters of the oval watch market. Like Omega’s Dynamic of the late 1960’s and 1970’s, the Millenary and Millenary Chronograph were designed to compliment the horizontal flow of the forearm by means of an oblong case extending along the wrist rather than over it. The shape also allowed the Millenary to duplicate the Omega’s feat of avoiding overlap with the Ulnar Styloid Process – the wrist bone. As a result, AP’s Millenary Chronograph sits flush against a user’s wrist and avoids the lopsided tilt that spoils the effect of many conventional round watches. Among chronograph watches for men under $100,000 USD, the oblong case shape remains rare, so the Millenary Chronograph represents an exceptional ergonomic triumph as well as a great value. Like a true “sleeper,” the Millenary keeps its big guns under wraps. Within the stainless steel case sits AP’s variant of Blancpain’s famed Frederic Piguet Cal. 1185 automatic chronograph. This movement, which was launched during the first mechanical watch revival of the 1980s, is acknowledged as a contemporary classic. Even today, Blancpain continues to sell a limited number of the devices to Vacheron Constantin and Audemars Piguet, which amounts to praise of the highest order. 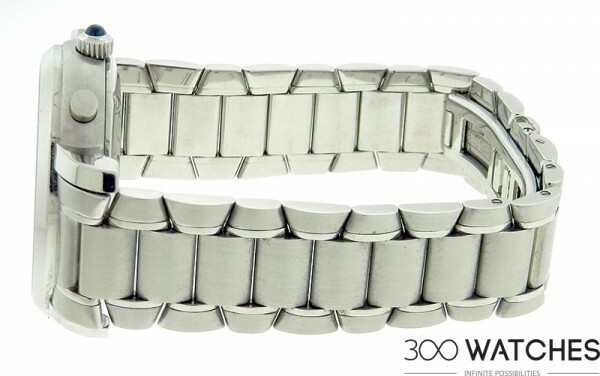 Also used in the (non-Offshore) Royal Oak Chronograph, the 1185 is thin, built in one piece (“integrated”) so that the chronograph, winding, and time-keeping elements sit in the same plane of clockwork rather than the sandwich arrangement of the modular chronographs. 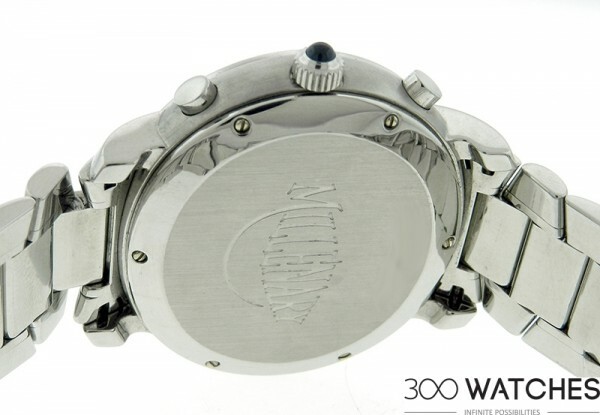 The movement uses a traditional column wheel to cycle between the chronograph functions, and the engagement/disengagement of the mechanism is performed by a vertical clutch. The former device ensures crisp tactile feel; the later complication prevents the “jumping” of the chronograph seconds hand that is common to horizontal clutch movements. Ask any connoisseur of high horology to rank the landmark chronograph movements of the past quarter century, and the Piguet 1185 will feature prominently on his list. A striking black dial completes this picture of sporting elegance. While it is a “sleeper,” the watch is anything but timid. A bold stylistic statement is provided courtesy of a white-on-black color scheme in which light Arabic Numerals and sword hands stand in stark contrast to the dark dial surface. 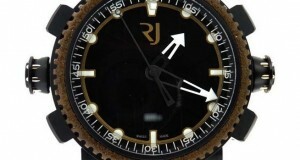 A jump-date window completes the timekeeping functions of the watch. Moreover, the Millenary Chronograph boasts the unique distinction of including both a tachymeter scale and a telemeter scale on its dial. 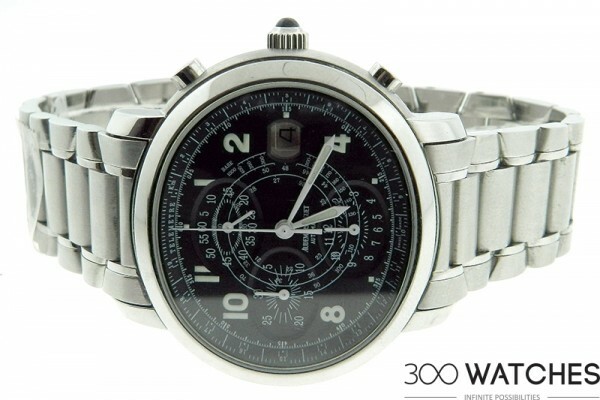 Among chronograph watches for men, tachymeter scales are fairly common for sporting applications in which estimating the speed of an object is pertinent to the competition. The tachymeter calibrations, which are located on the outer dial, diminish as they run clockwise. These figures indicate the speed of an object in kilometers per hour. When the object passes an initial stationary reference point, the chronograph seconds hand at “12” on the dial commences and continues until the object reaches a known reference point 1 kilometer from the starting reference point. Stop the chronograph when the target reaches that 1km reference, and its speed can be read directly from the tachymeter. The telemeter is another matter entirely. The Millenary Chronograph is one of the rare contemporary chronograph watches for men to feature this curious calibration. Almost extinct in modern horology, the telemeter emerged from the early years of artillery combat as a means of gauging the distance to shell impacts. By taking a known constant (i.e., the speed of sound at one’s present altitude) and recording the elapsed time between visible shell impact and audible shell report (explosion), it was possible to estimate the distance and make necessary adjustments. Because cannon shells could be in flight for longer than 60 seconds, the telemeter runs in a spiral whose distance figures increase as it winds inward. Audemars Piguet is a manufacture known for its fine finishing standards, and the Millenary Chronograph is no exception. Both brushed and polished stainless steel surfaces are present on the case, and the contrast of the two is reminiscent of AP’s use of alternating finishes on its celebrated Royal Oak line. The robust case is water resistant to 100 meters, and it features a sturdy solid case back. 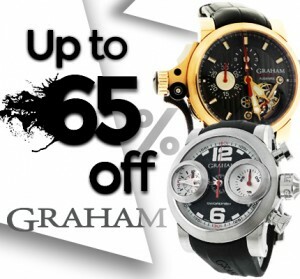 The short lugs ensure that the watch will suit a large range of wrist sizes. 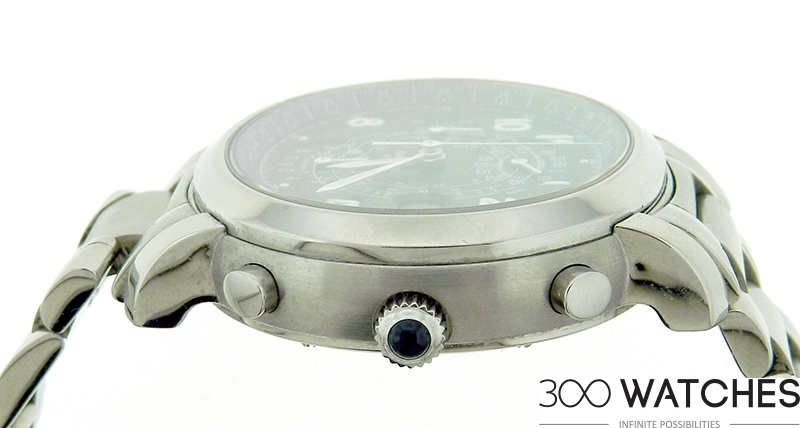 A cabochon-cut blue sapphire cap graces the knurled stainless steel crown. AP’s superb steel bracelet feels like silk on the wrist, and its smooth links combine with the ergonomics of the oval case to provide a uniquely comfortable experience. If the foregoing hasn’t registered, consider this; Audemars Piguet is more than just the Offshore, and the Millenary Chronograph is one hell of an underrated watch. It’s an Audemars Piguet and thus the progeny of a Swiss watch “Holy Trinity” charter member. The chronograph contains a true Rolls Royce of a movement at a price thousands of dollars below most watches containing the same F. Piguet 1185. In terms of ergonomic comfort and style, the Millenary Chronograph is a standout among chronograph watches for men – or women, for that matter. But consider yourself warned. Even “sleepers” eventually show that they mean business, and just as the Omega Dynamic prices started soft before jumping several fold, the Millenary Chronograph’s time in the sun will come. The thing about “sleepers” is that, sooner or later, their secret is out… don’t be the last collector to know. Striking and Long-Expected Novelties from Rolex – Surprising and Pleasing News at Baselworld 2014!